“I have never met a good angler who didn’t cut his teeth on public water”: those are the immortal words of my erstwhile regular fishing partner before he departed these shores for the desert. A Scot, Gordon ventured out into the big wide world armed with a qualification to teach English as a foreign language, an accolade I thought remarkably appropriate given that for him English is indeed a foreign language. However jokes aside his quote has more than a little merit, it is all too easy for one to imagine proficiency at this fishing lark if you only fish private waters. Perhaps a number of well-known angling writers suffer similar fate in that, as their fame spreads, invitations to fish the best waters at the best times of year and during the most prolific hatches dominate their calendars. For the rest of us, and despite all this blogging I have yet to be innundated with invitations to the Henry’s Fork, it is a case of competing with the other commoners who battle fish on public venues. In the UK in particular getting even reasonable fishing on rivers has in the past been something of a problem, certainly there were a good many Angling Associations which provided access to moving water and of course if you had the time and funds various Angling hotels with beats on rivers and lochs set aside for their guests , but that hardly comes under the heading of “public”. 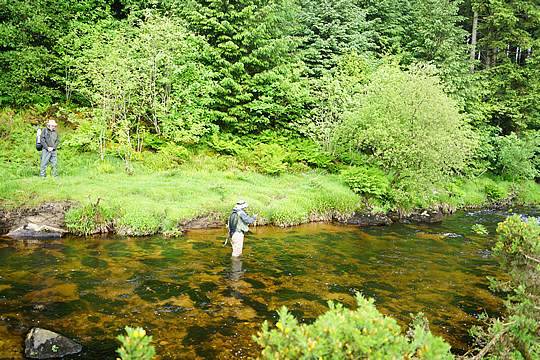 One of the better opportunities afforded the common man was to find some salmon water and arrange to fish it for the native brown trout that inhabit such flows. If you were fortunate enough to find such a place your only competition for space would generally be some retired colonel who was viewed as more than a tad eccentric because he “wasted his time” casting Greenwell’s Glories and Tupp’s Indispensables apparently unaware that his home turf was indeed “Salmon Water”. A recent trip to the UK however revealed a wondrously innovative move towards providing river fishing to those of us unfortunate to have been born with the dual encumbrances of “The Fishing Gene” and below average socio-economic status. Under the heading of an “Angling Passport”, waters in the South of England have been made available in a variety of formats to the general angling public. The Dutchy of Cornwall Waters on Dartmoor. In fact the Dutchy waters were recently utilised as the river venue for the 2014 Commonwealth Fly Fishing Championships, held in the Westcountry in June and encompassing various Stillwater venues as well as these wonderful clear streams. If my scribblings here don’t do the scheme justice I should point out that there is a booklet provided which details all of the variations with maps of the beats and detailed explanation of how the system works in full. The token scheme allows one to purchase tokens in advance, thereby cleverly avoiding the risks of actual hard cash being left lying about in the various boxes at the venues. The essential idea is that you purchase the tokens and then choose a beat on any one of a number of waters, drop the appropriate number of tokens in the box and go fishing. The scheme requires that you use the counterfoil “Catch Return” section of your tokens to file a return of what you caught on your completion of a day’s fishing and that’s about it. Generally speaking the better the beat is considered to be the more tokens it takes to fish it but variation seems to be between about three tokens and five as far as I could tell. I was able to take advantage of this part of the scheme fishing the Torridge (sadly coloured on my fishing day but full of potential had it not been for the overnight thundershowers) and the Teign, (A lovely piece of water of considerable expanse which offered more than enough fishing even on a busy and remarkably sunny Saturday). You will of course, for all the elements of the scheme, require a freshwater angling license, available from any post office, in addition to your tokens or booking fees. 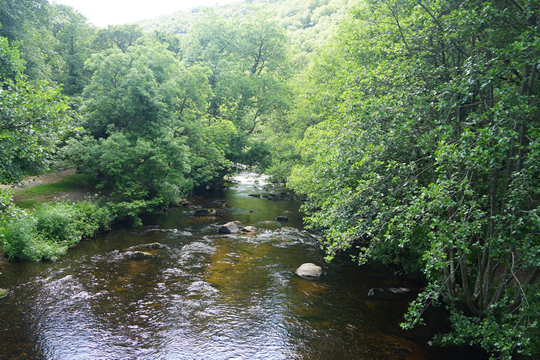 The token scheme encompasses waters covering much of the South West with rivers in Devon and Cornwall including sections of The Culm, The Tamar, The Torridge, The Teign, The Tressilian, The Fal and others. In reality that means that you could be based virtually anywhere in the South West of England and be within spitting distance of fishable and accessible water. Perhaps the only drawback would be that fishing is entirely open without any booking on this scheme and you could find yourself sharing with more than a few anglers on the best days. I have to say that my day on the Teign was particularly nice weather and over a weekend but there was more than enough river to go around even then. Don’t worry, the second part of the scheme provides a solution to that problem if you are so motivated. The booking office part of the process provides more beats on various waters which are booked in advance for your exclusive use. Under the booking scheme you pay with hard cash instead of tokens but there is a “wash off policy” ,which doesn’t refer to your getting up to your neck in mud and requiring a laundry service, but more that you can re-book the same beat on a different day (within the same season), if you are flooded off the water by unexpected spate. A nice touch that removes at least some of the risk of paying for your fishing up front. 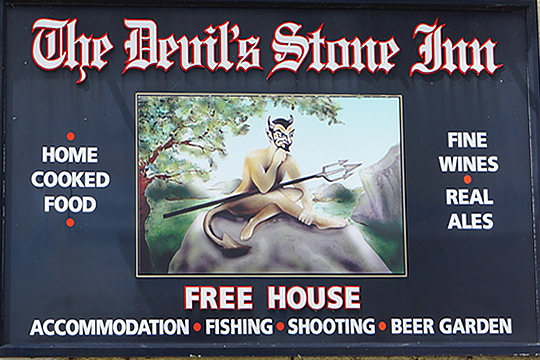 The Devil’s Stone Inn at Shebbear, one of numerous outlets of Passport Tokens and a lovely place to stop for a pint of real ale and some lunch. 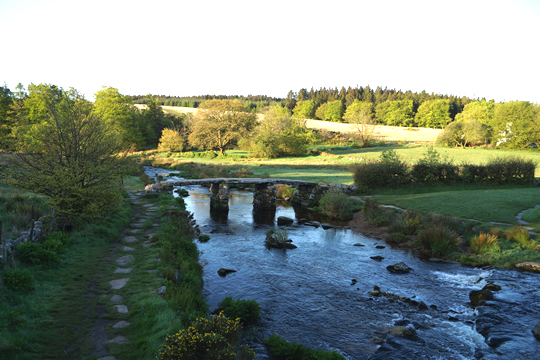 Then there is the Dartmoor (Dutchy of Cornwall) water, encompassing much of the East and West Dart Rivers. Delightful water which I was blessed to be able to fish during my stay prior to the Commonwealth Competition. I have to say that apart from the lovely water I was well looked after by Geoff Stephens of “Fly Fishing Devon” http://www.flyfishingdevon.co.uk/ He recommended where I might stay “The East Dart Hotel in Postbridge”, where I could get a permit (in this case the PO in Postbridge, but there are a number of other suppliers listed on the passport website) and hiked me up hill and down dale in search of good water and better fishing. This is remote country and having Geoff there to guide me for the first outing was a huge plus, I can heartily recommend his services if you wish to explore these waters. As a fishing guide myself I am well aware of the advantages of getting some local knowledge to kick start things and I wasn’t in the least disappointed to have Geoff with me on my first forays. In fact without his assistance I doubt that I would have found the best parts of the river or been confident enough that I was using the right tactics. 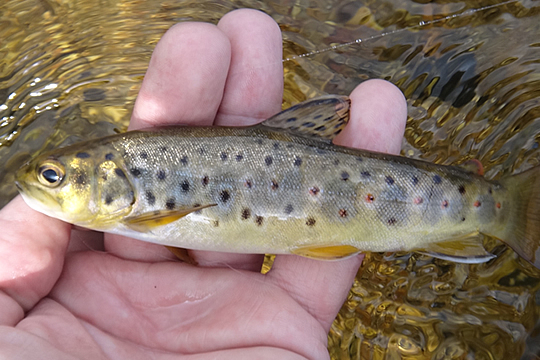 If you have yet to sample these streams, and I strongly suggest that you do, then you can contact Geoff or his partner Paul Kenyon on the mail enquiries@flyfishingdevon.co.uk or phone Geoff directly on 077 498 673 93. Fishing guides don’t really make a living out of it, we do it because we love it and we love to help other anglers get the most of their time on the water. Geoff definitely fits into that category and you won’t waste your hard earned cash by getting his assistance. 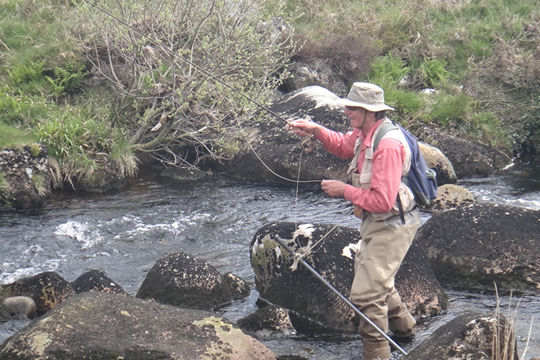 My Guide for a day, Geoff Stephens fishes a tight section of the Upper East Dart. Even if you are a complete neophyte Geoff as a qualified instructor can lead you through your first tentative steps and get you out there catching some fish. Token Beats available on the Passport Scheme, there are in addition booking office beats and the Darmoor Fishery to keep you occupied. 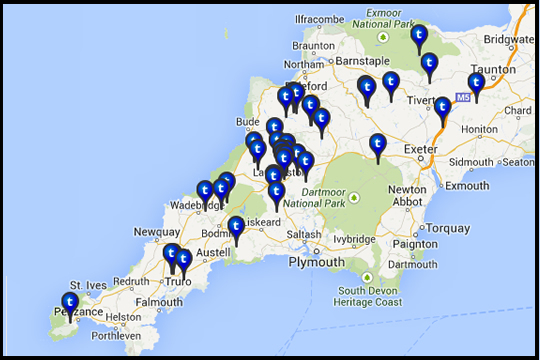 More than enough to offer fishing to anyone based in the West Country. Various books by the author of this blog are available from www.inkwaziflyfishing.co.za as well as retail and on line outlets including Barne’s and Noble, Smashwords and others.